Julianne Moore and her alter ego, Freckleface Strawberry, are back! This time, early readers can get in on the school-time action. The Academy Award-winning actress and author has published two more books in the series, which are illustrated by LeUyen Pham, and the pair are perfect for young kids who are going back to school. 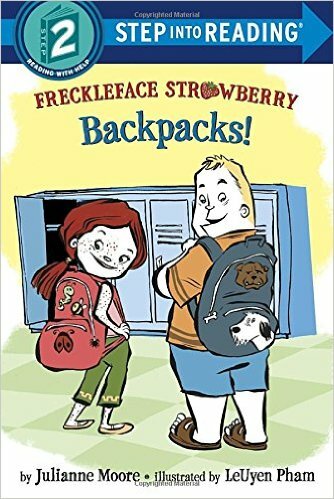 In "Freckleface Strawberry: Backpacks!" (SRP: $3.99 paperback), the 7-year-old Freckleface and her BFF, Windy Pants Patrick, have both accidentally packed something sticky and squishy in their backpacks. When those awkward additions get stuck all over their homework, the adorable pair have to figure out what to say to their teacher. 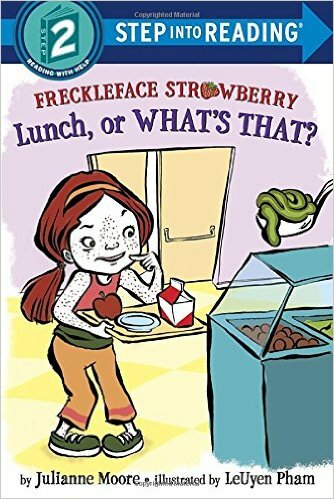 "Freckleface Strawberry: Lunch, or What's That?" (SRP: $3.99 paperback) is a funny take on school lunches, which can sometimes look a little like green mush. When Freckleface Strawberry grabs lunch in the cafeteria, all of her friends wonder what she has on her plate. Not even she can give them an answer. But when she finally tries it ... well, I won't give it away! CC checks out "Freckleface Strawberry: Backpacks!" Both CC and Will have read the latest Freckleface Strawberry editions. In fact, they're big fans! While CC has read (many, many times) the first set of the Julianne Moore-written books, Will has gotten just as much enjoyment out of them, too. He even loves the app — especially popping the digital bubbles. The Step 2 series is especially great for little ones at bedtime. The books use basic vocabulary and short sentences, which helps keep young readers confident and attentive. I would definitely recommend these new editions for your early reader!